Clutch systems that utilize these materials are made up of several components such as clutch facing, pressure plates, clutch discs, and flywheels. The many different mechanical parts require many different materials. Likewise, the myriad of applications for clutches necessitates variable construction. Clutch materials are used in automotive, railway, transit coach, motorcycle, construction machinery and agricultural industries to help control speed and gear shifting in vehicles ranging from tractors to race cars. No matter the size or specific part, there are general guidelines for clutch materials. These materials must be strong and able to resist wear effects as might be accrued from scoring, galling and ablation. As shifting gears generates heat as a byproduct, these materials must account for thermal expansion and remain constant at a range of temperatures, have high heat capacity, good thermal properties and conductivity. These systems inherently deal with a great deal of pressure making the ability to withstand high contact pressures essential to their functionality. Clutch apparatus may be exposed to the environment and must be able to endure moisture, dust and other environmental factors while continuing to provide consistent clutch engagement and disengagement. Many, but not all, components are subject to frequent friction. These particular components must exhibit all of the above qualities while also maintaining a high coefficient of friction, which is the ratio of the force of friction between two bodies in contact with one another. 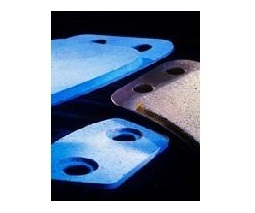 These friction materials are often rough or textured to provide added friction and increase efficiency. In general, the compression of a clutch pedal or lever causes several springs connected to a pressure plate to compress as well. This pulls the plate, and connected clutch disc, away from the flywheel which is bolted to the engines crankshaft. The disconnection stops the rotation of the clutch disc which intern disconnects the central hub of the disc from the input shaft. The driver may then shift gears or coast. After shifting, the pedal is released and the clutch disc reengages the flywheel. The clutch system works to ensure consistent clutch engagement and disengagement. Among the high stress but low friction components such as the pressure plate, steel, cast iron, aluminum and ceramics are common. While asbestos was once the most popular choice for elements encountering large amounts of friction, health hazards have lead clutch manufacturers to find alternatives. Ceramic, copper, steel, iron, mineral, cellulose, aramid, chopped glass, rubber and brass fivers are all used in the creation of composite materials used in clutches. These amalgamations are useful in that they retain the qualities, friction resistance and strength, of any and all powders and fibers used in their formation. These clutch materials are often attached via rivets or strong adhesives to metal bases. Field experience, as well as chemical and material engineering, allows constant advancements in clutch material design. These advancements result in reduced maintenance and operating costs, longer wear life, better functionality and overall consumer satisfaction. Clutch Materials Clutch materials encompass a wide variety of durable and heat resistant substances used in the construction of devices used to connect the engine of a vehicle to the transmissions input shaft allowing the temporary separation needed to shift gears and coast.